Brandt Snedeker won the 2012 FedEx Cup with a victory in the closing Tour Championship. This victory put him into the top ten of the Official World Golf Ranking for the first time. He has four PGA Tour wins to his credit, two of which he gained in playoffs. He has four top ten finishes in the major championships, most recently when tied for third in the British Open in 2012. Snedeker began his professional career on the Nationwide Tour from 2004 until 2006. Victories in the Showdown at Somerby and the Permian Basin Charity Golf Classic gave him a ninth place finish in the money list and a place on the PGA Tour for 2007. Snedeker got his career on the PGA Tour off to a flying start by shooting a course record equalling 61 at the Buick International. He led the field through two rounds but eventually dropped back to third. He made eight consecutive cuts that included three top-25 finishes in the early part of the year. An encouraging tied for twelfth at The Players Championship triggered the start of another consistent run through the summer. He finished in a tie for 23rd at the U.S. Open the following week and added two top-10 finishes in early July. An impressive debut in the PGA Championship followed, finishing tied eighteenth, and he grabbed his first tour victory a week later at the Wyndham Championship in North Carolina. This fine run of form saw his world ranking rise to 55. Snedeker was named the PGA Tour Rookie of the Year for 2007 after finishing 17th on the final money list and ranked 47th in the world. Snedeker recorded his first top-ten finish at a major at the 2008 Masters, finishing in a tie for third place. He trailed the eventual winner Trevor Immelman by two going into the final round but Snedeker struggled to a final round 77. That was still good enough to take him to 32nd in the world rankings. He again threatened at a major championship when finishing tied for ninth at the 2008 US Open. 2009 proved more of a struggle for Snedeker, making only 14 of 26 cuts and missing the cut in 9 of his first 12 tournaments. His form improved with a tie for 5th place at the AT&T National and a tie for 2nd place at the John Deere Classic. His progress was hindered by a rib injury and he missed the cut in all four majors. 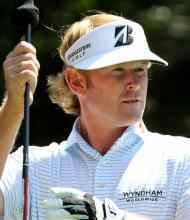 Snedeker made a confident start to the 2010 season including finishing runner-up in the Farmers Insurance Open. His form was in and out until he played the US Open, achieving a career-best tie for 8th place at Pebble Beach. 2011 followed a similar pattern, showing some promise with a tied 15th place finish at the Masters. Snedeker won his second PGA Tour title at The Heritage when defeating Luke Donald in a sudden-death playoff. Snedeker fired a final round 64 to get into a playoff from six shots back. Snedeker climbed to 38th in the world rankings after this victory before surgery to his right hip curtailed his season. Snedeker won his third PGA Tour title at the Farmers Insurance Open at Torrey Pines in 2012. On this occasion, he began the final round seven shots adrift of Kyle Stanley but shot 67. That still only looked good enough for second until Stanley made triple-bogey on the final hole to go into a playoff. Snedeker won with an up-and-down for par on the second playoff hole and moved into the World’s top twenty for the first time. In the 2012 Open Championship, Snedeker opened with rounds of 66 and 64 to equal the lowest 36-hole score. Rounds of 73 and 74 left him in equal third behind Ernie Els.